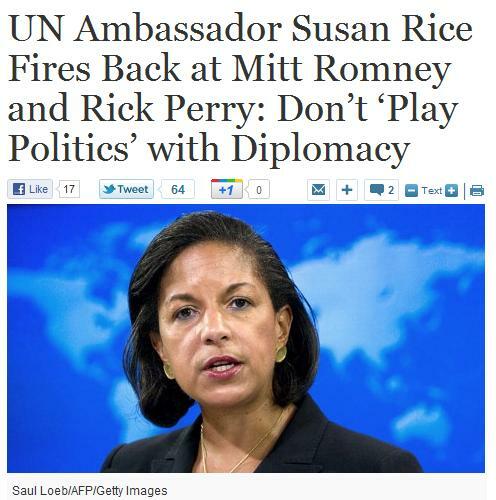 Ambassador Susan Rice is upset the Governor Perry and Governor Romney complaining about Barack Obama’s anti-Israel positions. President Obama faces a diplomatic thicket at the UN this week, and it’s drawing fire from the Republicans who want to replace him. This morning on “GMA,” Obama’s UN Ambassador fired back. Saying the Republicans were “playing politics” with international issues, Susan Rice responded to Mitt Romney, who called the President’s handling of Palestinian statehood an “unmitigated diplomatic disaster,” and Rick Perry, who suggested the U.S. should cut off funding for the Palestinian Authority if it continues to pursue a UN vote on statehood. “I think Governor Perry ought to really consider the real world implications of that for Israel. Because the security assistance that the United States provides the Palestinian Authority benefits Israel directly and Israelis are well aware of that,” Rice said. Twice during our interview Rice accused Republicans of “playing politics” with important international issues. “So for those who want to play politics they’ll play politics. But the reality is Israel has had no better partner than this administration,” Rice said.